For the second installment in the Healthy Breakfast series, I chose to write about nuts. They’re rich in protein and fiber, both of which help us feel full. Yes, they contain fat, but they’re low in saturated fat. Nuts are a good source of Potassium, Magnesium, Manganese, and fiber, among other things. All in all, a good way to start the day. After my talk with Katherine DiPietro in my last blog. I’ve had breakfast on my mind. Her advice to eat a protein-rich breakfast to start your day off right has had me thinking. I considered the many different types of food that people eat for breakfast. Many have no protein at all (think corn flakes or a frozen waffle). But nuts are a simple, effortless, shelf-stable protein-rich food. They’re sold almost everywhere, and nothing could be easier to eat. When eating nuts, the important thing to remember is that a serving size is one ounce. Most people don’t have kitchen scales, so here’s a general breakdown of approximately what one ounce of nuts is: 28 unshelled peanuts (7 grams protein), 23 almonds (6 grams protein), 49 pistachios (6 grams protein), 14 walnut halves (4 grams protein), and 18 cashews (4 grams protein). As a comparison, one large egg has 6 grams of protein. I find it easier to eat (and not overeat) nuts if I premeasure them into smaller containers. That way I don’t eat 5,000 calories in five minutes (trust me—I know from personal experience). Combine them with some dried fruit, and you have a pretty healthy little nosh. You could even call it breakfast, if you’re crunched for time. Don’t forget about peanut (or other nut) butter. I remember learning that a peanut is neither a pea nor a nut; it’s a bean, but since we call them peanuts I’ll include them. Nut butter is ubiquitous, and for good reason; it’s a delicious, inexpensive, nutritious food. It’s easy to spread on bread, celery, apples, or a spoon. It’s another great to-go option for a quick protein fix. 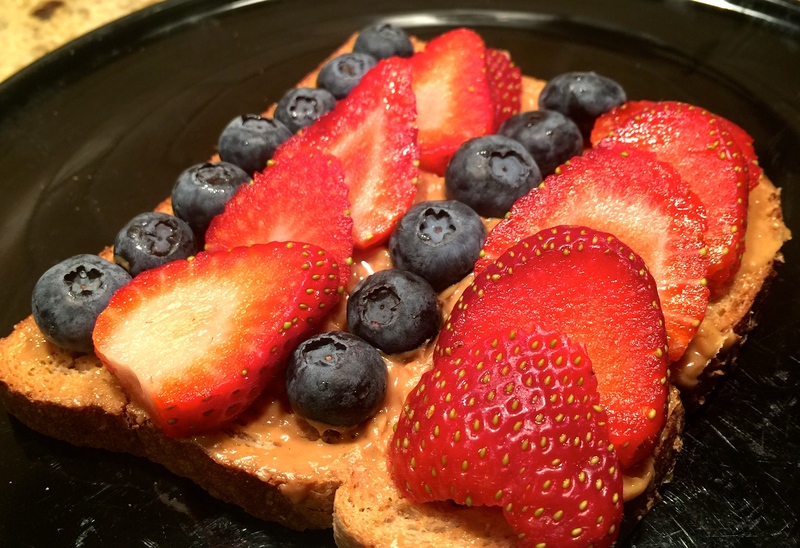 For a quick breakfast I like to spread peanut butter on a slice of whole grain bread or toast and top it with fresh fruit. Berries, bananas, and apples all work to add a bit of sweetness without the sugar of jelly—they’re a lot more nutritious too. Be creative and use whatever fruit you have around, with the exception of perhaps citrus or pineapple. If you're in doubt, give it a little taste and see if you like it. Oatmeal is another great breakfast medium for nuts. I wrote about overnight slow cooker steel-cut oatmeal in October. If you prefer to make your oatmeal in the morning, just follow the package directions. If you usually add water, consider using milk (dairy or non) instead. You’ll be adding more protein and nutrients than water alone. Check the label—not all non-dairy “milks” are created equal. Some have far more protein than others. Experiment with different nuts and fruits to see if there’s a combination you like best. I made oatmeal for this blog, and I planned to put pistachios on top, especially considering all the incredible health benefits I had just been reading. Then I had a niggling memory of a recent pistachio recall. I went online to investigate (thank you technology! ), and my pistachios were recalled for salmonella. So much for eating them all up. Needless to say, I chose to abstain. I went back to the cabinet to see what nutritional goodness I had on hand. All I had were pine nuts and chocolate covered almonds. I didn’t really want to taste-test pesto oatmeal (ew…give me a minute while I let that vision pass). And even though nuts enrobed in chocolate might elevate oatmeal to a whole new level of delicious, it kind of negates the idea of starting the day off healthfully (that’s why there’s a picture of a peanut butter breakfast instead of oatmeal). I hope this blog gives you a few more ideas of how to utilize nuts to add protein and nutrition to your breakfasts. Combine oats, milk, and cinnamon and cook according to package directions. Add berries and nuts. Spread peanut butter on toast. Top with fruit.